In the US homeownership rates are now around 65%. How does this compare to other nations? Is our 65% a "good" figure? Or is it too high or too low? Sorry its hard to read the nation names there but if you click the image you can get the full size chart. Compared to most nations the US homeownership (red) rate is relatively low. I don't think this means too much. 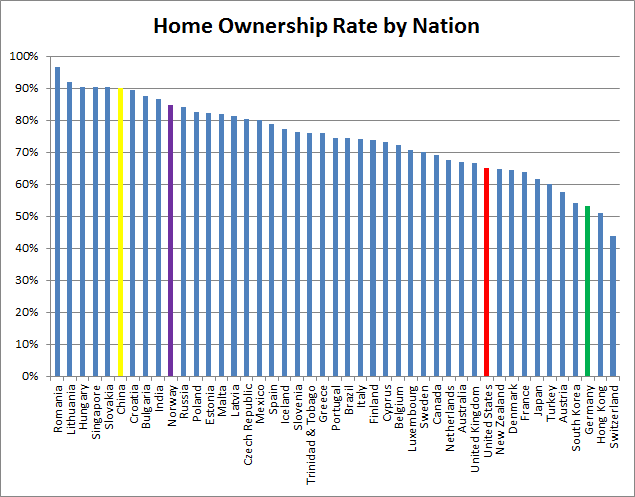 I don't think homeownership rates really reflect the strength of a nations economy or qualify of life. Compare Norway (purple) and Germany (green) both nations have strong economies and high living standards but Norway has 85% homeownership and Germany is at 53%. In fact more often than not the nations with stronger economies have lower homeownership rates, but thats a generalization with exceptions like Norway. In general I'd assume that homeownership rates can be based on the cost of housing versus the income levels. Homeownership may also vary based on how the nation handles debt and its cultural attitudes about housing.